This Leaflet Display Uses Detachable Hooks to Adjust The Size of the Literature Boxes! 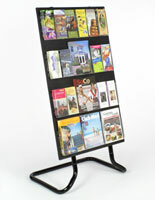 This Tall Brochure Holder Has a Wood finish! 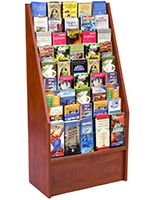 Order This Leaflet Display in Mahogany or Black Online Today! Sturdy melamine floor stand has an upscale mahogany finish that will complement any business. Configurable literature pockets can hold either 8-1/2 x 11 or 4 x 9 brochures. Ships partially unassembled to save on shipping costs. 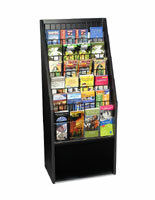 This leaflet display is a 47" tall free standing brochure display made of durable melamine. 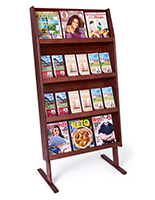 This versatile unit has an elegant mahogany finish and has (6) rows that can be configured to hold either brochures or magazine size literature. 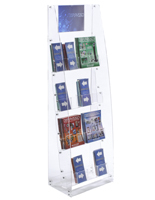 This brochure holder, stylish leaflet display comes with detachable hooks that can be used to change the size of the boxes. 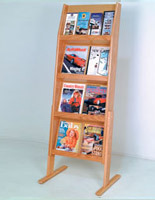 This attractive rack can feature either 12 or 24 separate literature holders. 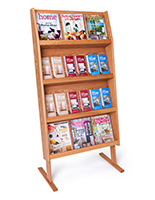 This commercial quality leaflet display, also known as a brochur holder, is ideal for use in high traffic areas such as lobbies, hotels, schools, guest or visitor centers and travel agencies. 20.0" x 47.0" x 11.5"
4.3" x 10.5" x 1.5"